High quality premium lawn turf grown from top rated STRI approved cultivators. Perfect for a medium wear family lawn. A specialist grass blend for high shade tolerance. This turf is also very durable, has a dense appearance and a vibrant colour. It copes well on heavy soils. 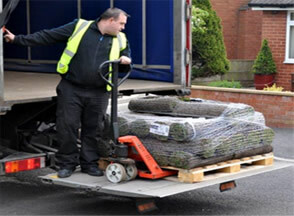 Turf deliveries will arrive between 9am and 6pm with a lorry equipped with a tail lift.